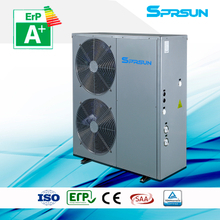 High temperature air source heat pump is a kind of industrial/commercial hot water heating equipment which uses refrigerant to circulate in the system under the action of compressor. The refrigerant completes the process of gas pressure rising and temperature rising in the compressor and then releases high temperature heat to heat water after entering the heat exchanger. High-temperature air to water heat pumps can be used as industrial water heaters to produce 70-80℃ hot water or even higher, for special industrial/commercial heating needs. For instance, some high-tech manufacturers/factories need a large number of high temp. hot water for experiments, then they can apply high-temperature air heat pump water heaters in their operations. 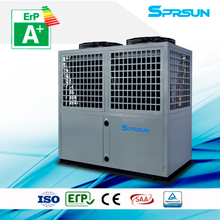 Ordinary air to water heat pumps are mainly suitable for bathing, producing 50-55℃ hot water. 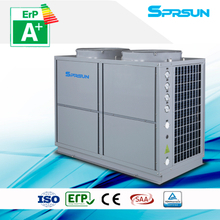 High temperature air heat pumps can achieve the best economic effects in many industries, such as electroplating, slaughterhouses, hotels, factories, schools, sauna centers, swimming pools, textile bleaching and dyeing and so on. 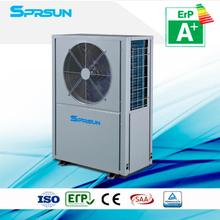 In simple terms, the use of such kind of heat pumps does not only save energy cost for enterprises, but also achieves a very safe and eco-friendly corporate image.